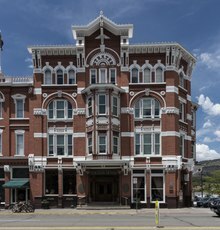 Strater Hotel, opened in 1888 during a mining boom in Durango. La Plata County is one of the 64 counties in the U.S. state of Colorado. As of the 2010 census, the population was 51,334. The county seat is Durango. The county was named for the La Plata River and the La Plata Mountains. "La plata" means "the silver" in Spanish. La Plata County was founded in 1874. This page was last changed on 23 September 2018, at 22:36.